The Motocross of Nations has been running since 1947, but the event has had to go through a myriad of changes through the decades to adapt to changing bikes, participation, and even television and media coverage. That includes adding 125s and 250s, as well as that darned one-moto-for-TV-format that plagued the 2002 and 2003 events. To help you keep track of it all, we’ve run through the major rule changes at the MXdN through the years for this week’s The List. 1.) The first Motocross des Nations is held at the Duinrell Estate near The Hague in the Netherlands on July 26, 1947. The race is inspired by the post-World War II fraternity of the Allied nations, and will soon be joined by Sweden and Luxembourg and, eventually, all the racing nations of Europe. But just three nations enter the first race: the host, Belgium, and Great Britain. Each enters twothree-man teams plus two reserves (“who, in spirit of the day, contested the racing even though they could have no influence on the result,” according to one report). After two motos, the Belgian hero Auguste Mingels takes the individual win on a Triumph motorcycle, but the team competition goes to British "A" team of Bill Nicholson, Fred Rist, and Bob Ray. 2.) The Trophee des Nations, for 250cc bikes, begins in 1961 in Avigliana, Italy. The British team of Jeff Smith, Dave Bickers, and Arthur Lampkin wins the first as well as the second, held in Great Britain in '62. 3.) In 1968, the Motocross des Nations expands from three riders per side to four, and the winners are the host nation from the Soviet Union (Shinkarenki, Petushkov, Pogrbniak, Angers). The Trophee des Nations also expands to four riders per side in 1972. 1985 was the first year that saw 125s/250s/500s race against each other at the same time. 5.) 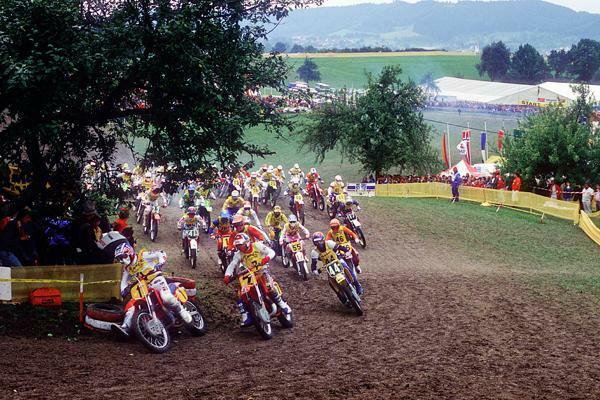 The biggest changes in the event’s history come in 1985, when the Motocross, Trophee, and Coupe des Nations are combined into a single event, still called Motocross des Nations. For the first time, 125s, 250s, and 500s race against each other in the same motos at the same time, with all three classes competing in all three motos. With twenty-one nations entered at the race in Gaildorf, Germany, sixty-three riders are on the track at the same time! The winners are Team USA: Jeff Ward, David Bailey, and Ron Lechien. 6.) The format is tweaked again for ’86, with each moto pared down to just two classes; 125s and Open bikes raced moto one, then 250s and 125s in moto two, and 250s and Open in moto three. This is the same basic format used today, though there have been changes back and forth since. 8.) In 2001, the old format of scoring each class separately is dropped. Now every rider’s score is based on his finish in the overall—tough sledding for the 125 riders, who can rarely even finish in the top five. 9.) The 2002 race is supposed to be held at Competition Park in San Manuel, California, but the track is never completed and the Indians who own the land become frustrated, locking out the promoters. The whole race moves to Spain after a three-week delay. However, a fill-in race driven by fan support is also pulled together at Glen Helen and dubbed the World Cup of Motocross. The winners are Australia, with Chad Reed, Michael Byrne, and Craig Anderson. As for the actual 2002 Motocross des Nations, it is rescheduled and held in Belpuig, Spain. The Italians win, but there is even bigger news in the shape of a format change—the three-moto format is scrapped, and one “A” final determines the winner. Also, the small-bores are dropped, and each team can bring over three 450s or 250 two-strokes if they want. Italians Andrea Bartolini and Alessio Chiodi finish second and third in the main moto to win the team overall. Javier Garcia Vico wins the moto in front of his Spanish fans. 10.) In 2004, the event, held in Lierop, Holland, returns to the old format of three classes and three motos. Hallelujah! On the other hand, the event name changes at this point, too, anglicized from the Motocross des Nations to the Motocross of Nations by the Spanish conglomerate DORNA, owner of the Grand Prix series and the Mxd/oN. This also means 250Fs are racing in the event for the first time—they weren’t legal back in ’01 when the race last used a small-bore class. In another small tweak, each team now has to count five of its six finishes toward its overall score—the previous three-moto format counted four of six. Team USA doesn’t race in 2004, though. Belgium, led by Stefan Everts’ double moto wins, takes the event pretty handily, with Steve Ramon and Kevin Strijbos doing their part. 11.) The FIM was been running a 23-and-under age rule in the MX2 (250F) class for a while now in the GPs, and that rule was around in the MXoN, too—until this year, when the MX2 class will open back up to riders of any age. But only in the MXoN, as the rule stays in place for the GPs. The 1964 Motocross des Nations, Hawkstone Park. Legends from Great Britain, Sweden and Belgium go head to head. Including a young Sylvain Geboers, and legendary British rider Jeff Smith. Team Great Britain won ahead of Belgium and The Netherlands.